The two tickets for Undergraduate Association President and Vice President debated Tuesday, highlighting the week of campaigning leading up to the start of elections this coming Monday. 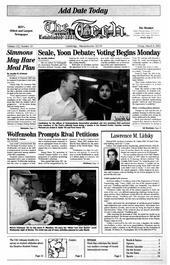 Residents of Simmons Hall may be required to purchase a meal plan next year. Last week’s announcement that World Bank President James D. Wolfensohn will speak at the 2002 Commencement exercises sparked heated controversy among members of the MIT community. He was assistant director of the MIT Plasma Fusion Center in 1983 when he published an article in Technology Review entitled “The Trouble With Fusion.” He wrote the piece, Lidsky said at the time, because “I couldn’t get an internal discussion going. Some didn’t care and some didn’t want to know.” A short time after the article appeared, Lidsky resigned his position, and Congress reduced funding for the fusion program by five percent the next year. Dining and computing are the two most popular services in the Stratton Student Center, a recent survey by the Campus Activities Complex showed.